Your slimming programme ensures effective slimming from the outside in AND from the inside out! 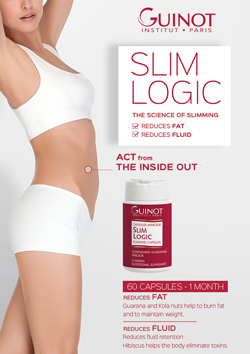 Maximise your slimming objectives with Slim Logic Capsules. Take them in addition to your salon treatment course and application of Slim Logic Slimming Cream. Slim Logic Capsules help burn fat for better slimming results. The fat- and fluid-reducing capsules reinforce and extend the effectiveness of Slim Logic treatments and products. Ask your Guinot ‘Beauty Doctor’ for advice! Beauty is in... the eyes!